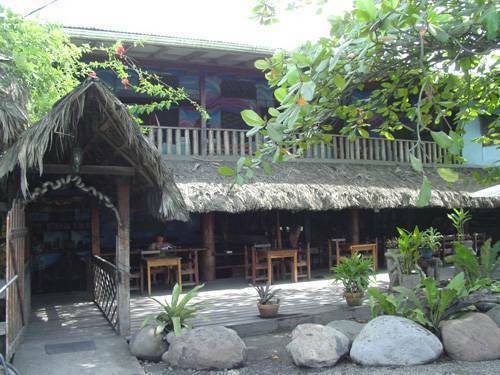 Kaya's Place is a 26 room lodge on the stunning Black Beach in Puerto Viejo, Costa Rica. 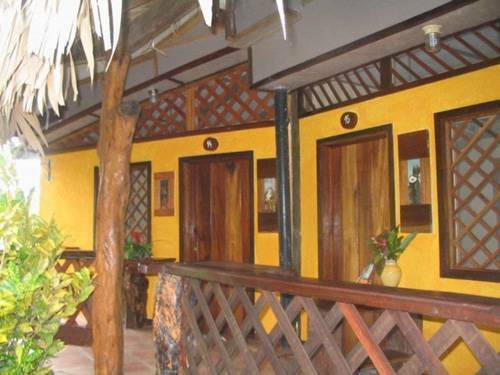 Built in the Afro-Caribbean "Rustico" style, the hotel is artistic and unique. The sound of the waves is always in the background, soothing and tranquil, guaranteed to take you away from the stress of everyday life. Kayas Place offers free WIFI in all the guest rooms and common areas. 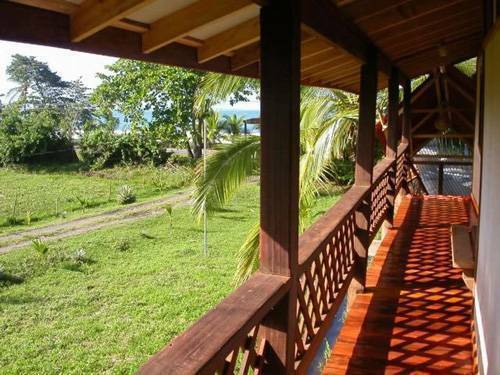 Our rooms have either a view of the ocean or the garden, which if filled with tropical plants. Our open-air restaurant and bar is casual with ocean view. Private Bath: Come standard with hot water shower, screened windows and fan. 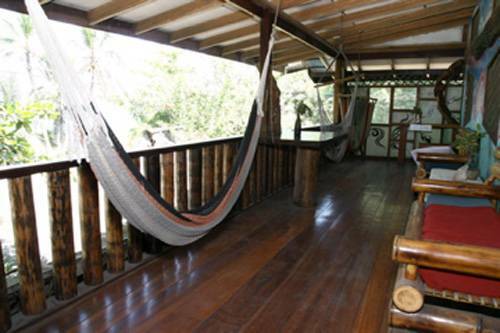 The rooms have rustic bunk beds and high ceilings and use of the shared balcony facing the Caribean waters. For the budget traveler who wants a neat place on the beach. GARDEN ROOMS Another option with private bathrooms is the garden rooms. More spacious with more privacy, they come with a hot water shower, mosquito nets, screened windows, fans and a private porch located in our tropical garden. We have two of these rooms that can be joined with the neighboring room for large family accommodations. Close to nature, private and quiet. Puerto Viejo is considered the gateway to the most bio-diverse region on the planet, found within the Talamanca mountain range. 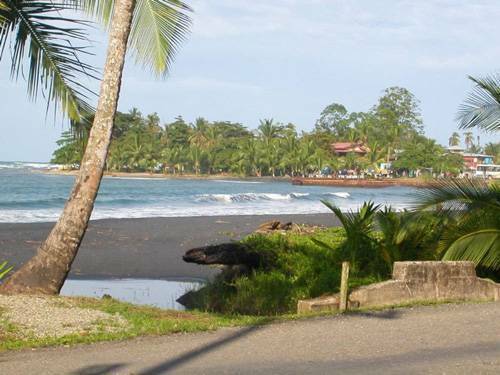 Visit the beaches of Cocles and perhaps view a soccer game on the small fields often packed with locals on Sundays. Explore one of the indiginous Reservations and learn about these ancient yet still productive cultures. Home Creek's Indian Reservation 4 km north of Puerto Viejo. Visit the Georgia Botanical Gardens. 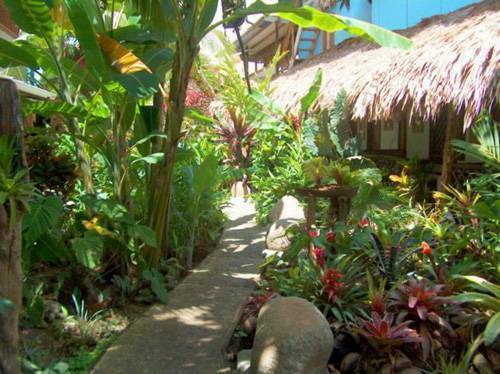 The owners have been growing spices, tropical fruits and ornamental plants for over 20 years. To the north the Butterfly Garden is a large screened garden representing many of the local butterflies in a natural environment. Also to the north, the Sloth Hospital helps sloths that have been hurt by cars, power lines, etc. They have a wonderful boat tour that takes you through the canals and lagoons where you can see sloths in the wild as well as other wildlife. Bird Watching - This is one of the best places in the world to see a multitude of colorful birds. Many can be seen right from the hotel. Tours – There is a wide choice of tour types, provided by local guides and outfitters. To fully view the plants and wildlife of the Caribbean coast, we recommend you take guided tours. Canopy Tours - view the jungle from the top of the trees. Jungle Tours – Cahuita National Park, and the Gandoca-Manzanillo Wildlife Refuge are two large national parks are close at hand to see wildlife and fauna. Alligators, iguanas, reptiles, owls, monkeys, and parrots are common sites. Farm Tours – Chocolate and Cacao demonstrations, medicinal and botanical gardens. Local farmers demonstrate how crops are raised in a jungle environment, both by horse or by foot available. Waterfalls - cool off in the water and enjoy the sites. Turtle Watching - several options are available to see them and to learn how important they are to the local ecology. Thank you for considering us for your stay. We require a deposit of 10% of the total reservation. For on-line reservations, we ask for a credit card number which will be charged for the deposit. The deposit is refundable less a $35 cancellation fee if the room is cancelled prior to 14 days of arrival. Cancellations received within 14 days of the scheduled arrival date are non-refundable. During designated Holiday periods (Christmas and Easter week), cancellations made within 1 month of the arrival date are non-refundable. By making an on-line reservation, you agree to the terms of the reservation and cancellation policy. Please contact us with any questions. Again, thank you for considering us for your stay! You can take the bus from San Jose, too. The Terminal Gran Caribe Station has express and local buses daily both to Limon and on through to Puerto Viejo. Several tour guides offer airport and hotel pickup and direct service here, too.